Those who don’t know us say that New York City is a dog-eat-dog town. We may act like alpha dogs, but real New Yorkers are truly poodles at heart. In fact, the data show that one in seven households in our city have at least one pup under its roof – so we must be softies deep down. Did you know that there are ruff-ly 425,000 canine companions in homes across the five boroughs? That means that there are more dogs in New York City than there are people in Oakland, California! As of February 2017, there were 85,085 dogs in New York City with active licenses. Dogs are required to be licensed by the Department of Health and Mental Hygiene, although only about 20% of dogs are licensed. The latest registry from the Department of Health and Mental Hygiene includes licenses issued between September 2014 and February 2017. The oldest dog with this profile is Ozzy, a Brooklyn-native Labrador Retriever, born in August 1980. Following, Ozzy, Ruby, and Buckeroo of Brooklyn and Manhattan were born in 1985; Genevieve, Guy, and Zadie followed suit in 1987. Although the dataset includes seven dogs born before 1989, we hypothesize that a handful of owners mistakenly reported their own birthdate instead of their dog’s since the oldest dog on record—an Australian cattle dog named Bluey—was 29 when he passed away in 1939. More recently, a few new pups were born and licensed in February 2017 including Coco from Queens, Otis from Manhattan, Mia from the Bronx, and George from Brooklyn. The following maps highlight neighborhoods with high populations of licensed dogs, the majority of which are located in Manhattan. Figure 2 indicates that zip code 11109 of Long Island City has the highest proportion of dogs per capita, with 180 licensed dogs and 4,702 people (about one dog for every 26 people). Zip codes at locations #2 through 10 have approximately one licensed dog per 27-41 people. Large human and dog populations do not necessarily coincide. Few licensed dogs claim the southern tip of Manhattan, yet because zip codes 10004 and 10006 also have low population estimates, these neighborhoods have the fourth and seventh largest number of dogs per capita. Figure 2: The top ten zip codes for licensed dogs per capita similarly reveal high concentrations of licensed dogs in Long Island City and along the west side of Manhattan. Figure 3: Manhattan had the highest number of dogs with active licenses as of 2017. The same is true for the number of veterinarians and pet and pet supplies stores in 2015, with the exception that Staten Island had more veterinarians than the Bronx. The pet industry expanded widely over the decade from 2006 to 2015. Across the City, New York gained 38 veterinary firms and 64 pet and pet supplies stores, with increases in each borough, except the Bronx, which had 12 veterinary firms in 2006 and ten in 2015. Meanwhile, Manhattan saw an increase of 12 veterinary firms and 27 pet stores, and Brooklyn gained ten veterinary firms and 19 pet stores. Brooklyn had the highest rise in jobs in both veterinarian and pet store businesses: the number of veterinarians increased from 463 to 682 and the number of pet store employees increased from 180 to 348. Veterinarians in Brooklyn experienced the largest salary increase (43%) up from $32,017 in 2006 (or $37,799 2015 dollars, adjusted for inflation) to $45,884 in 2015. It is normal for pet owners to consider their pet to be a family member (95% do) which may explain lavish expenditure trends. The American Pet Products Association reported that total spending in the U.S. pet industry was 60.28 billion in 2015, or 0.3% of GDP. Over a quarter of total pet expenditure went toward veterinary expenses, second only to food which accounted for 38% of expenditure. Popular dog names include traditionally human names. Last year Bella was the most popular dog name in New York City and in the U.S. at the same time that Isabella ranked sixth for female baby names. Concurrently, Sophia was the most popular female baby name while Sophie ranked tenth for dog names in the City and eighth in the nation. The charts below reveal some variety among popular dog names in the City compared with the rest of the country. For example, Coco was the second most frequent female dog name in New York City, but was not as popular elsewhere in America. Bella and Max are the two most common names in all boroughs, except Manhattan where the top two names are Charlie and Lucy; Bella and Max come in fourth and fifth. The following tables gather dog names into comparable categories, using names with 20 or more occurrences, from the database of New York City dogs with active licenses as of 2017. New Yorkers tend to be foodies as evidenced by the large number of dogs named after foods or beverages—from Kiwi and Muffin to Brandy and Whiskey. Common dog names indicate that dog owners are also well-versed in geography, notable historical figures, and movies. The City is home to 148 dogs named Brooklyn, 28 named Einstein, and 128 named Simba, just to note a few. Dogs named after other animals, including Moose and Monkey, demonstrate owners’ senses of humor. You can interactively explore names from a similar Department of Health dataset here. Figure 4: Four of the five most common breeds among dogs with active licenses in New York City are small dogs, perfect apartment and subway-riding size. 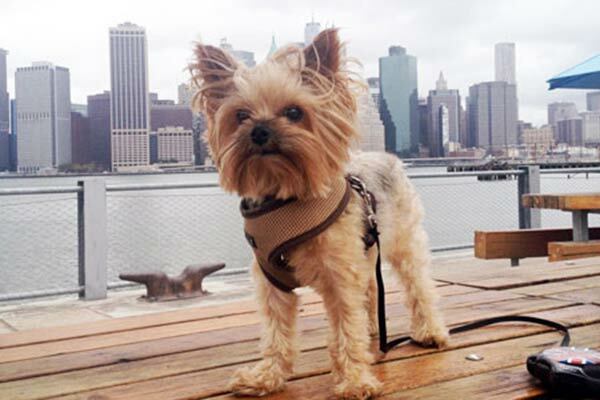 Yorkshire Terriers are the most common breed in all boroughs, except Staten Island where they come in second, behind Shih Tzus. The top breeds commonly own the top names—Bella and Coco for female and Max for male dogs. Figure 5: Dogs are dominantly black, white, brown, or tan. Less common colors range from fawn to apricot, blue merle, and red sesame. Additionally, of New York City’s 85,085 licensed dogs, 54% are male, 83% are spayed or neutered, and 83% are vaccinated for rabies (one of the purposes of mandated licensing). 44 are registered as guard or trained dogs. Want to make sure your dog is represented in the data? Information on the benefits of dog licensing can be found here. Note: a previous EDC blog used national census data to infer the number of pets in the City. We now use dog license data from the NYC Department of Health and Mental Hygiene to estimate the number dogs in the City. This estimate is to be interpreted with caution, as it is unclear exactly how many dogs are unlicensed, and therefore, how many dogs there are in total. Estimates differ due to differences in data sources. Median incomes were reported for 164 zip codes in NYC, including nine of the top ten neighborhoods for dogs/capita. Note: counts represent the total number of dogs with a given name so counts in the female category may include male dogs and vice versa. Names are categorized by gender based on which gender was more prevalent in the sample.